Work, not mere talk, leads to profit. We can say our desire is to get out of debt, have a nest egg for retirement, pay off our house, and build wealth, but unless we actually do some work none of it will happen. Daily, focused, hard work over the long haul brings an increase of money that we can use to pursue our financial goals. That’s what I want my children to learn. They need to feel the burden of work. If I just give them money (which is what an allowance implies), where will they learn that value? They also need to experience the financial reward of work. To that end, we have developed a commission based payment system at our house that rewards our kids with money for the chores they complete each week. Do the work and get paid. Forget to the do the work and you don’t get paid. It’s as simple as that. We’ve been on this plan for five years since our oldest daughter was eight. In that time, our four kids have grown in responsibility to the point where they are significantly contributing to the household chores. And of course, as their responsibilities have become more advanced, their pay per chore has increased. The idea of giving commissions for work versus giving kids allowance for existing isn’t simply about external profit. When we push ourselves to work and pursue greatness, something develops internally that cannot be measured. Our character is built in a way that wouldn’t be possible if we were just given things. I’ve shared before how my college professor for History of Civilization was notorious on campus for being tough. His content was enormous. His lectures were tedious and often over my head. Tests were a picture of brutality. It was apparent from the moment I stepped into class that I would be in over my head. Even though it would negatively affect my GPA, I decided before the 6-week drop/add period expired that I was not going to quit the class. I would see it through to the end. So when finals approached, with a passing grade hanging in the balance, I settled down with a few classmates and some Mountain Dew for some all night study sessions. I remember the feeling walking out of that final exam knowing I had given it my best. That positive feeling was only topped later after receiving a passing grade of C. In academics, C usually means “average,” but there was nothing average about that grade to me. The grade itself was awesome, but I was more proud in myself…in the effort required to pull off that grade. I had pushed through a psychological barrier of effort in that freshman level class that truly helped me understand what true work meant. Those long hours of focused hard work in that one class helped develop the character I needed to propel me through the rest of college. That’s what I want my kids to feel – to know there is financial profit in labor but also that it builds character. I don’t think they will develop that as keenly if I just hand over money to them every week. How specifically does this play out in our house? As a follow up to this on Thursday, I’ll share exactly what chores our kids are doing, which ones we pay them for and how much they receive depending on their age. Questions: Do the kids in your house work for money or do you give your kids allowance? In general, do you think the kids of today are struggling with the concept of working hard at a task? If so, what do you think is the leading contributing to that? Is there any other way we can make them see the value of work? With four sons, there’s certain to be four unique qualities and personalities, but my two oldeset are as different as night and day as any two siblings can be. The oldest spent every cent he acquired, whether it was from gifts, money he earned, or coins he found in parking lots. My second hoarded everything he had; I really was concerned about his love of money. We struggled with how to teach them about money – one to practice saving and the other to unclench his fist, and finally did use an allowance system for a few years. However, from that they had to pay for half of bigger ticket things like church summer camp, school yearbooks, etc. That seemed to be the only way to teach one to practice saving and the other to understand he’d one day be fully responsible for his needs and wants and have to watch more than a couple of dollars leave his possesion. They’re in their 20’s now, and the oldest took a lot longer than I’d hoped but he’s learned to handle money much more responsibly now. The second is still tight with his money and hates having to pay for things like utility bills and rent, but he’s able to pay cash for vehicles and has a down payment ready to put on a house. Kids are certainly different. I see that in my own four. I haven’t been able to pinpoint their attitudes towards money because they are still rather young. I do know my oldest looks for deals (she purchased a refurbished iPod with her own money) and they all seem to have a giving spirit. I like those two qualities for sure. I never got an allowance as a kid and it worked out fine for me. I didn’t have many “wants”. Also, although I wish my parents could have paid for my college, being in student loan debt has taught me the value of hard work. I can hustle! I know no one will take care of me but me. I know some people that do think a lot of the jobs I do are beneath them, but I know I have character and am getting ahead, slowly but surely. I think you are teaching your kids a great lesson! “I know no one will take care of me but me.” If only more people believed in that creed. “One time I asked him to wash the car for $5. He said “how about $10.” I answered how about zero. He replied “$5 is fine!”” LOL…I love it! Sounds like he learned the “something is better than nothing” lesson. To be honest this is one thing I’m not looking forward to when I have kids. I have no idea where I stand on this issue. I totally get where you are coming from and there are definitely rewards beyond monetary compensation when it comes to work. It’s important to recognize that, ideally from an early age. Well you will have at least 5 or 6 years to figure it out once you have kids. Can’t start them much earlier than that. It’s turned out for us better than we thought. My son has a rewards chart that pays for various activities and similar to you, the effort and reward are up to him. When he gets older, we have thought about paying for schoolwork which is the most comparable thing to job performance, it would all depend on how amenable his teacher’s were to sharing with us his “effort” grade which means more to us than his letter grade. Our kids are little, but we don’t plan to give them an allowance when the time comes. I may pay them for certain chores or provide them with opportunity to earn money, but I don’t believe that I owe them a weekly dollar amount just for being born! Besides the things we pay them for, we do offer them opportunities to earn more. This puts the responsibility on them to ask to do those chores if they want. +1 to drawing the direct connection between work and money for you kids. Sounds like the Ramsey approach, Brian. Check out the excellent new book “Smart Money, Smart Kids” by Dave and his daughter Rachel Cruze. BTW: if an allowance is actually provided as a budget for a set of needs (like clothing), it can be an outstanding personal finance learning tool – a great way for kids to learn how to manage expenses. Allowances and pay-for-jobs approaches can be mixed and matched in intelligent ways for kids too young to cover all of their own expenses. I’ve heard many good things about that book and what we do has been heavily influenced by Dave’s ideas. We might move towards a model of giving kids some money once they reach the teen years and teach them how to budget that. But they will still be doing a bunch of chores around the house as long as they live here. We don’t give our kids an allowance. They have chores they have to do because they are part of the family and they have other chores they can do to earn money. We want them to have money so they can learn to manage it, but we don’t want to give it to them without having them learn to work hard and earn it. We are similar in that we don’t pay them for everything. There are tasks they do simply because they are part of the family. I’ll share what those are on Thursday. What a fabulous post! I never got an allowance as a child, but I did work for my dad’s cake business and babysat starting at 12. I had to pay “rent” at 10% of my work earnings. It certainly taught me so much about hard work, value of labor, and persistence! That’s cool being involved in the family business. 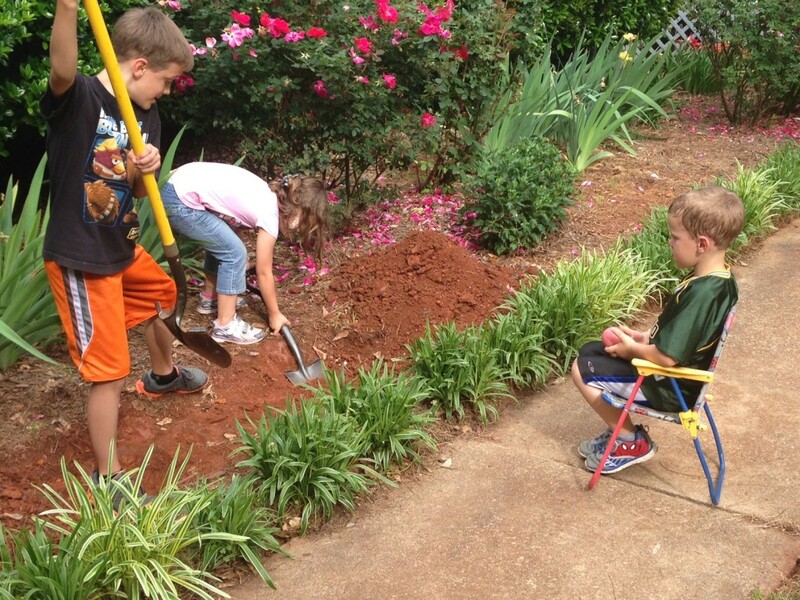 Our kids have earned extra money that way as well when they help with projects at our rental properties. This is something that I’ve been considering when I have kids later in the future. I think it’s a good way to teach children the value of money, and that it doesn’t just come from trees. That would be interesting…a world where money grew on trees. There would be many ramifications to that, a lot of them negative. My parents never simply gave me an allowance, I had to earn it. I had a little chore chart for each week, and every time I completed a task, I’d get a star. They would add them up at the end of the week to determine how much I got. I think it’s a lesson well worth teaching. No one in real life is going to give you money on a consistent basis just for existing! We do a chore chart as well. We’ve gone through several versions as we try to improve them based on what we have seen work/not work. Good for you guys! We aren’t parents yet, but I’ve spent a lot of time thinking about this and I definitely think that when we do have kids this will be the type of system that we’d like to implement. Getting paid just for existing and breathing is not very real-world in my opinion. “Getting paid just for existing and breathing is not very real-world in my opinion.” Agreed Dee…Sadly, that is what is happening all over the place. Six years of age is a great time to start this John. We started at five with very small chores the kids could handle. Of course you have to train and inspect (and sometimes help) but they can get simple stuff at that age. I’ll outline on Thursday the chores our kids are responsible for so you can get an idea of what we are doing. Brian – I really enjoy your blog. I especially enjoyed reading this one. Our society is really feeling the impact of a “gimme” mindset. It’s refreshing to see that you are teaching your kids what hard, honest work is. Keep up the great work. Thanks Terri for the kind words and the comment. It certainly is tough to fight the “gimmie” mindset society is pushing. It really makes what we teach our children in regards to hard work that much more important. I believe the kids that “get it” will be the ones who get ahead in life. I agree with the whole not giving kids an allowance just because they exist – get that totally. However, I am not above bribing my kids to excel academically and if that means $ for grades – I’m in. We did that with both our kids in grade school and high school. It paid off in spades. Those measly dollars we “rewarded” them with for A’s turned into real scholarship $ for college. They probably would have gotten the same grades without the financial bribe, but I’m for hedging my bets.